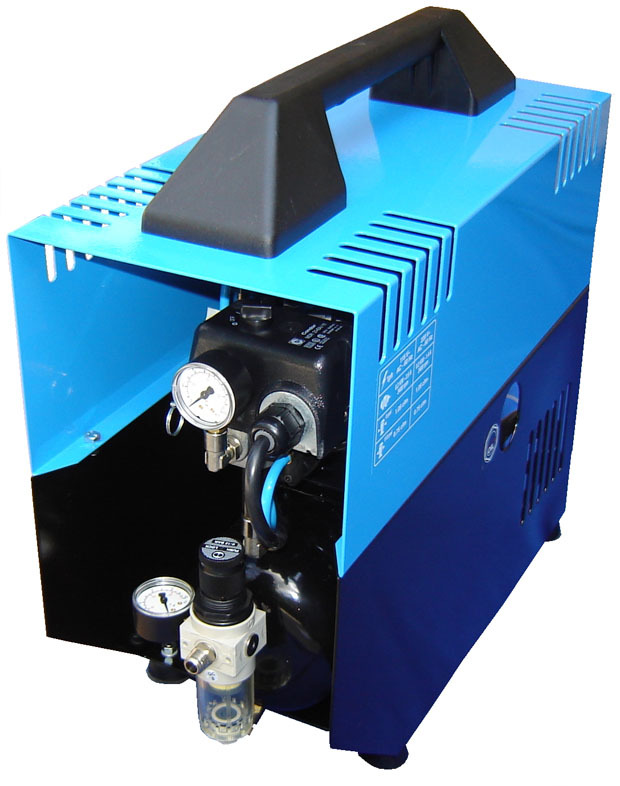 Dimensions: 17.4" x 8" x 17.5"
As the name suggests, this Silentaire DR-300 Super Silent Oil Lubricated Compressor is one of those whisper quiet compressors produced by Silentaire Technology. The company carries a broad range of compressors including oil and oil-free options. Based on the specific needs of the customers, different product lines of Silentaire compressors are able to satisfy all the airbrushing requirements. No wonder, that quiet air compressors have become very popular with artists and hobbyists and turned the company into the market leader within their industry. To make your airbrush job even more comfortable and quiet, the manufacturer has built the Super Silent line of air compressors. These work almost noiselessly and at the same time provide sufficient power for your projects. Besides, these are totally automatic. That means that the compressor pressure switch automatically shuts the compressor down everytime the pressure increases to a certain level. a handle allowing for easy and balanced carrying. As practice shows, if used and maintained in a proper way, the Super Silent airbrush compressors will serve you faithfully for many years. many more light-duty airbrush jobs. This model is oil lubricated what allows the compressor to reduce friction and, hence, noise level. While running, its operation sound level does not exceed the noise level coming from your refrigerator. So you may not care about working during late hours or disturbing your customers. Many users consider the Silentaire DR-300 Super Silent Compressor as their favorite air compressor. According to their opinion, this unit is very reliable and it never fails. Using it, you get the exact result you needed. In addition to it, this compressor is relatively lightweight. With the tank size of 1.0 Gallon and the overall weight of 42 lbs, the compressor is a nice option for airbrush artists who look for portability and optimal performance. In short, the price of this device is totally compensated by the quality. The packing also includes an instruction manual and tank certificate, oil bottle type. The original 12-months warranty covers repair or replacement of any compressor parts, that the manufacturer considered defective. Note, that the guarantee is valid from the date of purchase. The electric parts, as well as worn parts, are not under guarantee. In case tampering or bad usage are detected, the guarantee will be terminated. 23" x 20" x 9"